In Bobby Ether and the Jade Academy by R. Scott Boyer, it all starts with an earthquake. Then Bobby Ether's life changes. He gets a phone call about his parents being in an accident and a mysterious woman shows up to take him away, but he doesn't believe she has his best interests in mind. He ends up being whisked away to the Jade Academy where he's quickly given an introduction to the metaphysical world with instructions on how to manifest abilities he's not sure he has, and how to harness a powerful energy called Anima which connects everything living. As he's caught up on the history of the school, he discovers the headmistress of the Academy has a dangerous secret and students are being used for experiments to perfect humans with metaphysical abilities. His new friends offer their help to find answers and to help him understand how everything happening at the Academy connects to his family's history. Bobby remains strong in what he believes and doesn't just go with what he's told; instead, he searches for his own answers. As he enters the school, he becomes something of an outsider and struggles to manifest any abilities, which is a frustration for him. As he learns about his new environment, he also befriends Lily and Trevor who take him under their wing. They are genuine friends to rely on and who are willing to stand up for him when he needs it the most. A central part of his journey focuses on his grief over losing his parents and his determination to find answers, which propels him to uncover secret after secret. The biggest connection he makes at the Academy is with Jinx, a little boy who is the son of the headmistress and whose sister is a bully who targets Bobby. So they get off to a complicated start due to this built-in friction that isn't the fault of either boy. Jinx is a delightful character, an eleven-year-old boy who is way too serious so this encourages Bobby to nudge him into playing a game and having some fun. Bobby Ether and the Jade Academy by R. Scott Boyer is a riveting adventure with magic, betrayal, and discovery. R. Scott Boyer weaves in plenty of twists as Bobby explores metaphysical abilities and digs into the truth the Academy has buried. 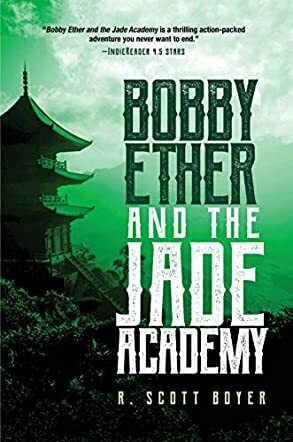 Bobby Ether and the Jade Academy blends themes of mystery, friendship and family into an action-packed metaphysical adventure that finds Bobby facing betrayal, fighting danger, and uncovering plenty of secrets waiting to be exposed.